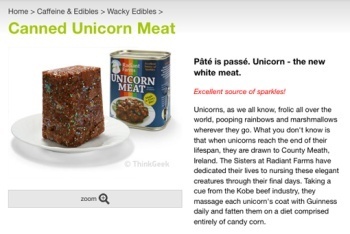 The National Pork Board of the United States has threatened legal action against ThinkGeek for infringing on its "Other White Meat" trademark in advertisements for canned unicorn meat. "Unicorns, as we all know, frolic all over the world, pooping rainbows and marshmallows wherever they go," says the ad for Radiant Farms' Canned Unicorn Meat. And as they age, they are magically drawn to Ireland, where the Sisters at Radiant Farms nurse them through their final days, massaging Guinness into their coats every day and fattening them up with candy corn. "PÃ¢tÃ© is passÃ©," the ad says. "Unicorn - The New White Meat." Unfortunately for the Sisters and unicorn connoisseurs around the globe, the ad, which coincidentally or not debuted on April 1, caught the attention of the sharp minds at the National Pork Board, which is responsible for research, consumer information and the promotion of pork as a food product. Its most famous work is the "Pork: The Other White Meat" advertising campaign, which dates all the way back to 1987 and is still in use today. Slogans with that kind of staying power are very few and far-between, so it should come as no surprise that the Pork Board acts very aggressively to protect it. Thus did the Pork Board, through the law firm of Faegre & Benson, send a 12-page cease & desist letter to ThinkGeek, advising it that the unicorn meat ad violates "The Other White Meat" mark held by the NPB. In response, ThinkGeek has issued a public apology for the unintended confusion, assuring the Pork Board that it is not attempting to supplant pork with unicorn meat. "It was never our intention to cause a national crisis and misguide American citizens regarding the differences between the pig and the unicorn," Geeknet President and CEO Scott Kauffman said in a press release. "In fact, ThinkGeek's canned unicorn meat is sparkly, a bit red and not approved by any government entity." ThinkGeek also apologized for the long, awkward pause in the conversation when it explained to the Pork Board over the telephone that unicorn meat doesn't actually exist.